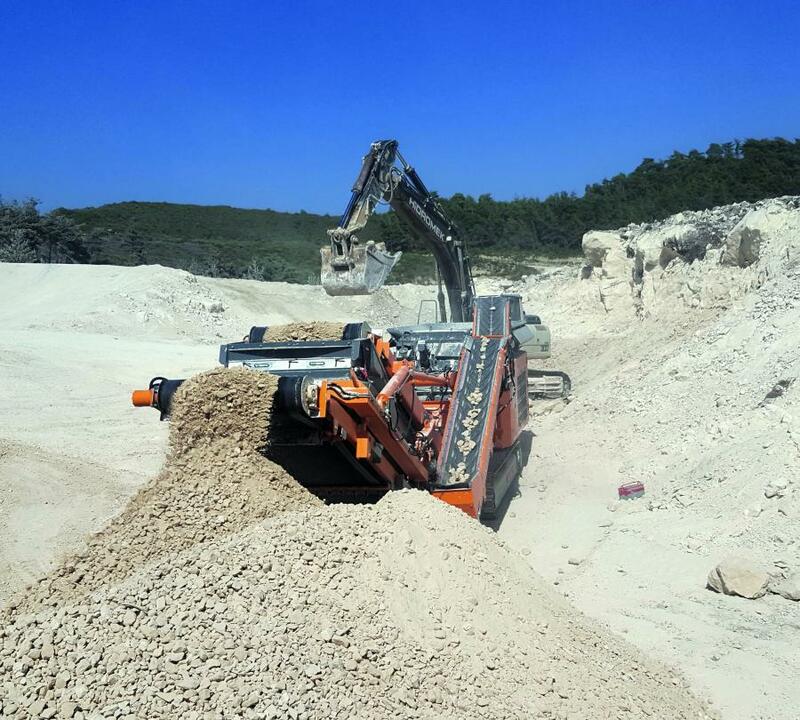 Use of the R1100S in road construction in the Gaziantep region (southern Turkey), when crushing limestone to 0 to 1.4 in. (0 to 35 mm). The traditionally important region in southern Turkey — located on the border with Syria — is still one of Turkey's most important industrial areas. For the expansion of the infrastructure, executing companies especially focus on machines with best reliability. The Rockster impact crusher R1100S, which was demonstrated at trial runs, convinced the end customer with its performance, but also especially with its flexibility and compactness. Now, after more than 9,000 operating hours in continuous operation, the R1100S also has proven its stability. Rockster's long-standing Turkish partner Alfamobil looks after the end customer in the handling of this road construction project. Apart from maintenance work and the replacement of the usual wear parts, the crusher was without problems in hard use. Equipped with the screenbox RS104 and the double-functional return / stockpile belt RB95, the machine crushes limestone with edge lengths of up to 28 in. (71 cm) to 0 to 1.4 in. (0 to 35 mm) final grain. By using the pre-screen, the sandy part of the broken material is removed and — in just one step — a high-quality cubic final grain is received, which is best carrier material for road construction, according to Rockster. The compactness and the resulting simple transport is a major advantage of the Rockster crusher, especially in road construction. The operators like the easy handling of the new crusher and the quick set-up, as the machine is put into operation within 10 minutes. Also, the adjustment of the entire crushing plant to the requirements at the site is very easy to accomplish. Due to the positive experiences with the first crushing plant, the customer has decided to order another mobile crusher from Rockster Recycler. The new additional R1100DS crushing plant has meanwhile been delivered and has already been put into operation. Again, it meets the customer's requirements to the fullest satisfaction. The two plants together ensure a rapid expansion of the important transport link in the booming region in southern Turkey. For more information, visit www.rockster.at or www.rocksternorthamerica.com.